As early as 1963, even before he had gone into business for himself, Clive Sinclair was fascinated by the possibility of producing a miniature television. The difficulties were considerable. The biggest problem was that of powering the display: liquid-crystal displays were not invented until the 1970s, forcing Sinclair to rely on miniaturised versions of the cathode-ray tubes (CRTs) used on conventional televisions and monitors. Even when shrunk, CRTs demanded a considerable amount of power. It was also extremely difficult finding suitable miniature CRTs in the first place. Sinclair nonetheless was able to obtain the CRTs he needed from Hitachi. By 1966, the Sinclair team had advanced to the point where they were able to display a prototype miniature TV, dubbed the Microvision, at the Radio and Television Show at Olympia. The prototype Microvision was a 2" 405-line receiver which would handle all 13 channels in bands I to III. The speaker was a 2" piezoelectric transducer with an overall depth of less than ¼". The set was powered by six pen light cells, and its total power consumption was less than 450mW, including less than 100mW for the tube heater. Its weight, including the battery, was 10.5 oz. The cathode-ray tube was designed by Twentieth Century Electronics and focused using magnetic deflection. 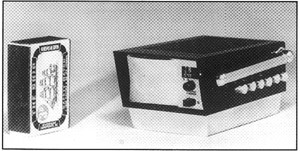 Although Sinclair prematurely advertised the Microvision as being an "amazing Sinclair trumph" available from 1967 for 49 guineas (right), the device never went into production. It was simply too difficult to manufacture, test, service and repair, due to the way that it had been constructed. Technology had also moved on, and the Microvision returned to the drawing board for another decade.